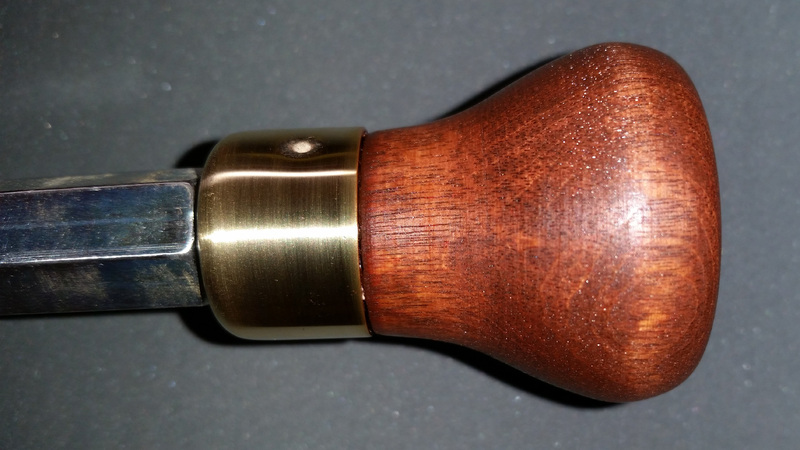 Handle, cap, and crank knob are finished. I’ve been meaning to post this for a week, but I’ve been dealing with a car accident that totaled one of our vehicles (nobody was badly injured). I have been planning for some time to buy a small blasting cabinet, which would facilitate cleaning up the frame and main wheel of this drill, as well as speeding up future projects, and I was waiting on that to post the second half of this project. Now it’s looking like that might be a little while down the road, so I wanted to go ahead and post this bit in the meantime. 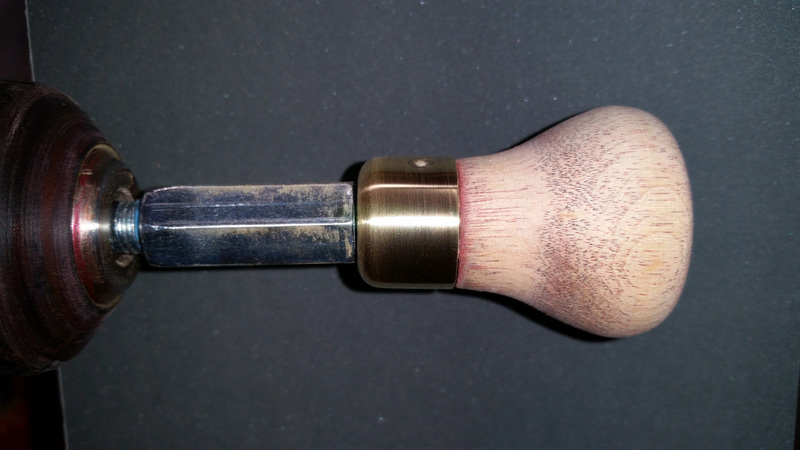 The cap has a coat of poly, while the handle doesn’t yet. This little holding block was very useful for managing the parts as I finished them. 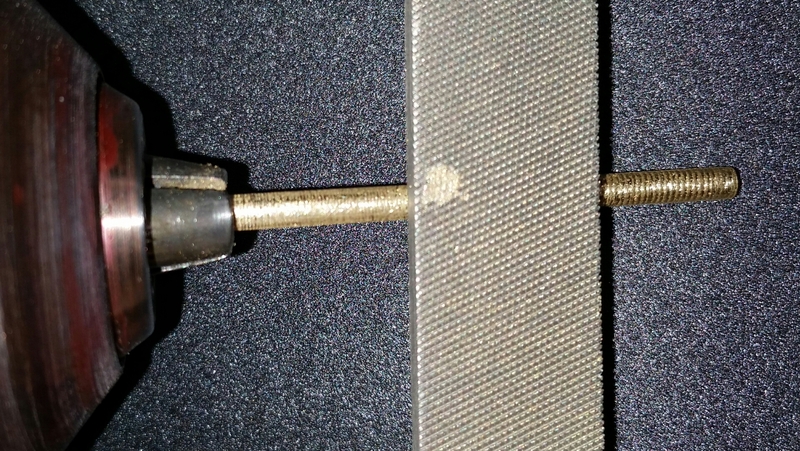 The unrestored side knob usually poses a minor challenge: how to grip the threaded shaft without damaging the threads? The side knob on the MF no. 5, as well as on MF no. 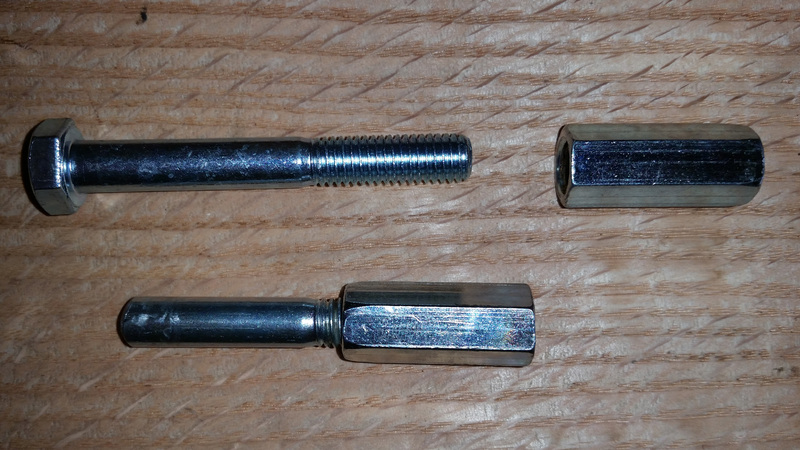 2A, Craftsman 107.1, and Goodell-Pratt 5 1/2B (that I know of) is threaded at the non-standard thread pitch of 5/16-20. Happily, 5/16-20 is very, very close to the metric thread pitch of M8-1.25. It’s actually close enough that you can thread a M8-1.25 bolt into the frame, and you can thread the side knob into a M8-1.25 nut. I built a drill adapter using a bolt and a coupling nut that allowed me to chuck the side handle into a drill without mangling the threads. As an aside: you can locate 5/16-20 taps ($8.50 in 2016) and dies ($11.50 in 2016) made in HSS at Victor Machinery Exchange. I haven’t done business with them, but they seem to have what would be needed if you wanted to tap your shop-made replacement handles. I cut the head off a metric M8-1.25 bolt and threaded the bolt body into a M8-1.25 coupling nut, using locktite to create a semi-permanent bond. 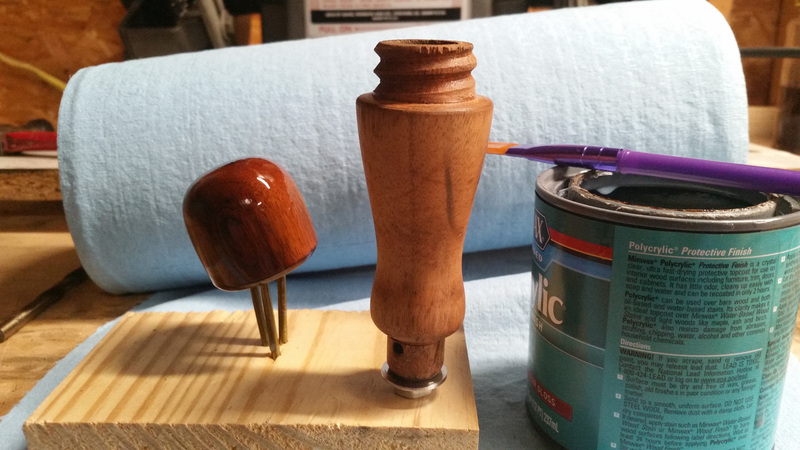 The adapter can be chucked into a drill to spin the side knob for sanding. 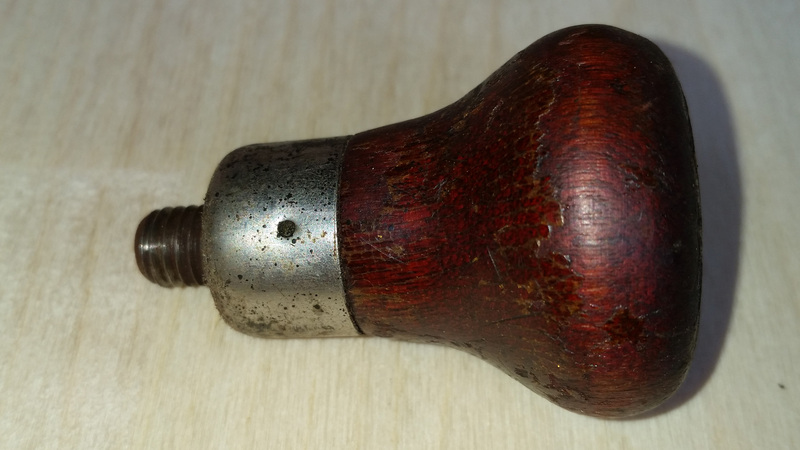 Here is the side knob, chucked into an electric drill using my adapter and sanded to bare wood. 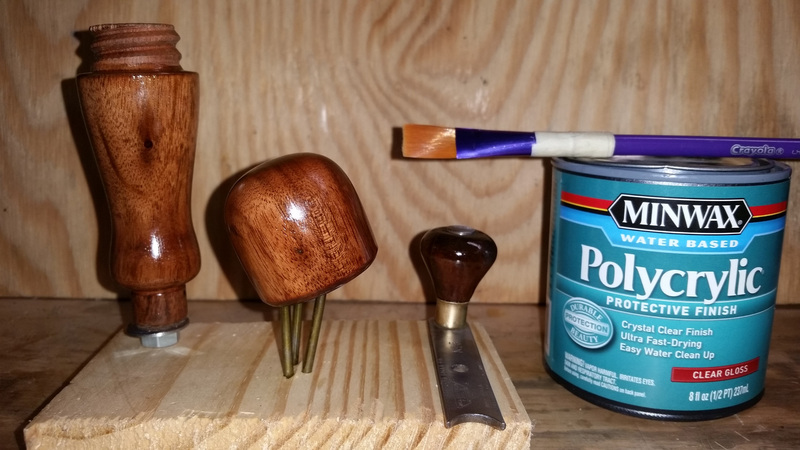 The wood was sanded to 400 grit and the ferrule was sanded to 800 grit. I applied a few coats of brown and cabernet stain (about a 4:1 ratio). I haven’t yet applied poly or wax at this point. The old pins were bent and rusty. They measured about 7/64″, so I filed down some 1/8 brass stock in my electric drill. The file leaves a nice grippy texture on the new pins. Ok, all for now. Told you this would be a short blog. The link to part 3 with the frame and wheel blasting and paint job is at the top of the page.